Below you can find our preference list along with a short explanation of our choices. To see every party’s official preferences for the NSW Senate seat, click here. * The Pirate Party told us they would not be doing preference deals and were instead having a vote of the membership to determine the group ticket, which they would publish on their website. This was certainly a decision we could respect as the Group Ticketing system is fundamentally flawed and undemocratic, with a high degree of incentive toward tactical voting and backroom deals. Accordingly at their request we wrote an open letter to their membership pointing out the high degree of policy overlap we had and offering to unilaterally preference them as least as high as they voted to preference us. However as the end of the draw on Friday, less than 24 hours before close of group ticket lodgements, they had not apparently had a vote, or decided on a preference list by other means. Hence we ultimately preferenced them lower than we had originally intended. ** The choice of how to preference the major parties was not a light one. Unfortunately under Abbott’s leadership the small l liberal aspect of the Coalition has been strongly de-emphasised and conservatism has become front and centre. Furthermore the Coalition’s primary message now almost entirely concerns managerial competence and not policy ambition, which may be a legitimate case to make regarding the house of representatives but has no role in the Senate. Their economics have been almost entirely populist rather than liberal, and of course exploiting xenophobia against asylum seekers for electoral gain is antithetical to Future Party values. On many major issues where the Coalition does have stated policy, it stands in direct opposition to our own, for instance, carbon pricing and the NBN. We also had to consider the likelihood of a Coalition victory in the lower house and the advantages of a Senate acting as a counterbalance to the government of the day. *** Our basic methodology in distributing preferences beyond groups we had deals with was to first split the parties into “tiers” and then rank them within those tiers. In the case of both the unendorsed and ungrouped candidates we had no way of evaluating what they stood for and thus erred on the side of caution, ranking them behind all other tiers bar the last one. The exception was the “AG” column unendorsed group, headed by Tom Wang. We spoke to a representative of theirs in person at the ballot draw and therefore were able to form a (favourable) view on their policy platform. We ranked individual candidates from each party in the order printed on the ticket (top down); for the ungrouped candidates we ranked them bottom up, on an ‘anti-donkey’ vote principle. The Future Party endorses the redevelopment plans announced by the NSW state government earlier today. 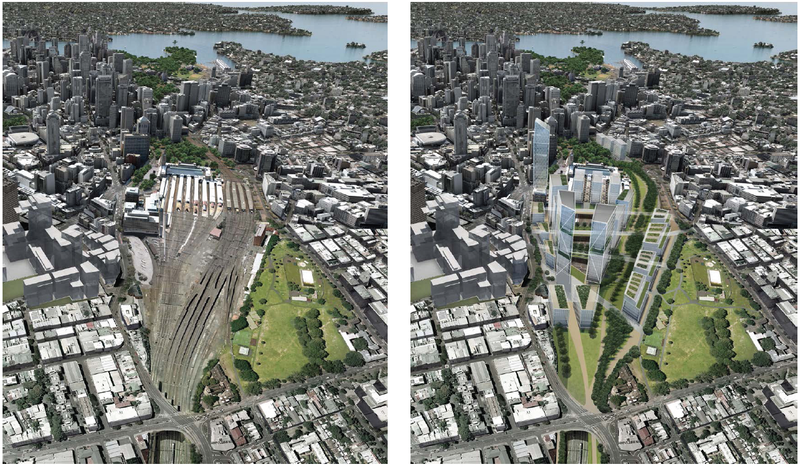 The plans would see development being built above open areas of the rail corridor between Redfern and Central station. Currently, the area is little more than a vast expanse of open air-train tracks. The state government is aiming to attract developers to submit plans for the area, which will likely feature a number of high-rise apartments and office buildings. The development will also aim to let pedestrians cross the rail corridor much more easily. Increase housing supply is the key to easing the housing affordability crisis in Sydney and other major centres in Australia, and high density urban infill that is well supported by existing and new infrastructure is by far the most effective way to increase supply. The Central-Redfern rail corridor is the main public transport artery of the city and an ideal location to make use of unutilized space. Higher population densities in inner city areas with matching investments in infrastructure is a key policy of the Future Party. Greater density means shorter travel times to jobs, and reduced per capita infrastructure costs for government. It also provides benefits to residents by putting more services within easy travelling distances of their homes. The NSW government is to be congratulated for promoting these ideas, and it is essential that they follow through and deliver them – Sydney can’t afford yet another unrealised planning vision. The Future Party hopes we will see politicians of all parties around the nation come to terms with reality – that our cities badly need more housing and more density, if young people and struggling are to afford rents let alone home ownership. If you would like to read the full proposal, it is available as a PDF here. The Future Party, one of Australia’s newest political parties, is calling on the Greens, the Labor Party and the independents to reject the changes to 457 visa conditions, which would require employers to seek Australian residents for positions before applying for 457 visas. I am pleased to announce that the Future Party has been successful in attracting over 500 eligible voters as members. This means that the Future Party has reached the minimum membership requirement to register a political party with the Australian Electoral Commission. The registration process could take up 3 months according to the AEC, however registration in time for the election is likely. At the meeting yesterday, we were asked about some of the material that inspired our ideas. One of the ideas that a lot of people said needed more explanation was our charter city, Turing. The Future Party has had extended internal discussion about the need for patent reform and what such reform would entail. Below is a summary of our beliefs regarding patents at the moment, which focuses on software patents, a highly contentious form of patent. The Future Party has released its website and is looking for people to become members. The Future Party needs 500 members to join the party by Monday 13 May 2013 so that it can run as a party in the September 2013 elections. If you have read our policies and would like to join us, then please visit the membership form page and sign up today. The Future Party is a new movement of people who are dedicated to thinking of long term solutions to advance our society. The Future Party believes quality of life is improved primarily through technological developments, sourced through a scientific approach to knowledge in the context of democracy and peace. We see innovation, education and economic reforms as key to the success of Australia.